The island of Cyprus is located in the Mediterranean Sea and is one of the largest islands in the area. Evidence of its ancient civilizations dates back thousands of years, and it has been a site of much study, with historians noting that, among other distinctions, this may be the first place where cats were domesticated. As a tourist destination Cyprus is extremely popular, with its rich history of art and music that can be seen on display and experienced through local artists and musicians. The sunny climate is appealing to many tourists, as is the cuisine, which includes many locally grown fruits and vegetables as well as seafood from its shores. The island is divided with part of it Greek influence, dating back several thousand years; and the other part reflective of Turkish culture, which has only been a part of the island for about 500 years. Tourists who come to stay for a while often stay in villas, and these Cyprus villas are places of comfort and relaxation. While resting at these villas, you can soak up the sun and enjoy the tasty meals that are often prepared by those associated with the Cyprus villas and included in your stay. As you eat, you can talk over all of the different sites that there are to visit and try to determine which ones to fit in. A guidebook is certainly advised so you will have a better idea of where to go, though it’s also a good idea to ask for advice from the locals, as they will be able to give you a better idea of where to go off the beaten path. One of the most popular pastimes in Cyprus is rock climbing, and as this is an island of many cliffs and dizzying views, it is an ideal place for it. Several different locations are especially suited to this. For instance, Cape Greco is a picturesque climbing area in the south eastern part of Cyprus. Part of a nature preserve, it offers 50 different hiking trails through mountains of soft limestone. If you’re very lucky, you might even manage to catch a glimpse of the sea monster that locals claim inhabits the waters near the cliffs. 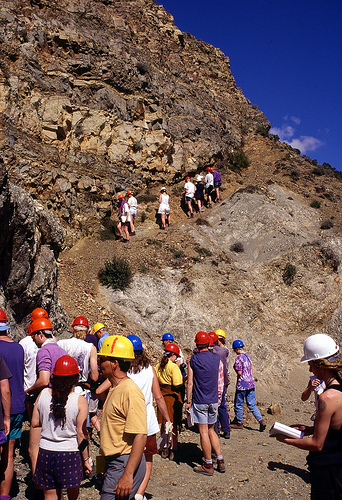 The above photo shows a group of climbers in the Troodos Mountains, Cyprus. Another interesting destination for rock climbers is Dhiarizos, which is the most popular of the many climbing sites on the island. Of the 25 routes that are offered, some are considered among the island’s most picturesque. The limestone here is hard, and the routes here are more suited to avid outdoorsy types. The routes here tend to be especially challenging. Droushia features mostly sandstone instead of limestone and is situated on the outskirts of a tiny village that offers an enticing slice of bucolic Cyprus life. 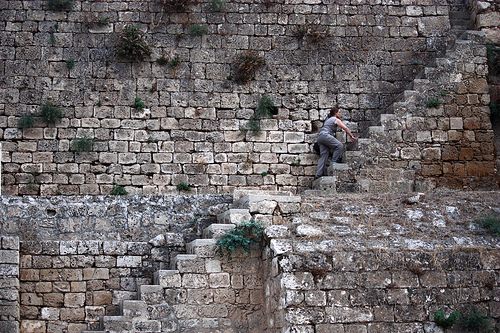 While the warm weather Cyprus enjoys year-round makes it ideal for climbing at any time, spring and autumn are the best times for this activity. Taking into account climbing routes found all over the island, there are about 100 that are sports routes best suited to experienced climbers, while about 200 can be attempted by those with little experience. These often are found near each other, so climbers of varying skill levels can travel together but then split up once they reach their basic destination, scattering to paths of different difficulty levels. Not everyone finds rock climbing appealing, but if you enjoy nature and scenic beauty at all, you will most likely find plenty to appreciate along these Cyprus routes. Hiking far up above ground level is a wonderful way to get an expansive view, and the sense of accomplishment will make the trek even sweeter.